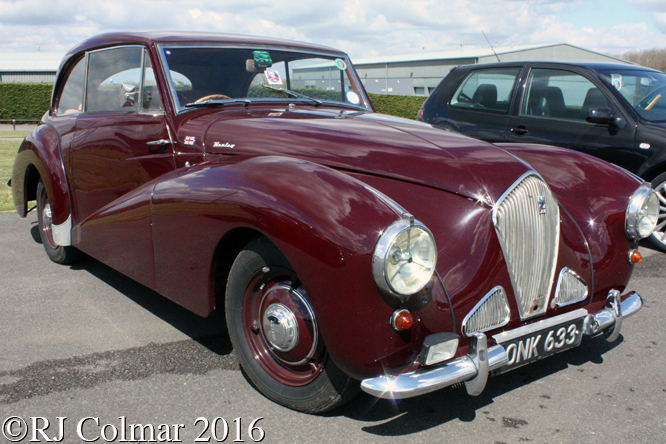 In 1950 Donald Healey and Samuel Elliot fell out over their Healey Elliot 2 door saloon car which resulted in Donald turning to Tickford to build further 2 door bodies. Tickford was founded as a builder of horse drawn coaches in the 1820’s by Joseph Salmons on Tickford Street, Newport Pagnell and diversified into building coachwork for cars in the late 1890’s. 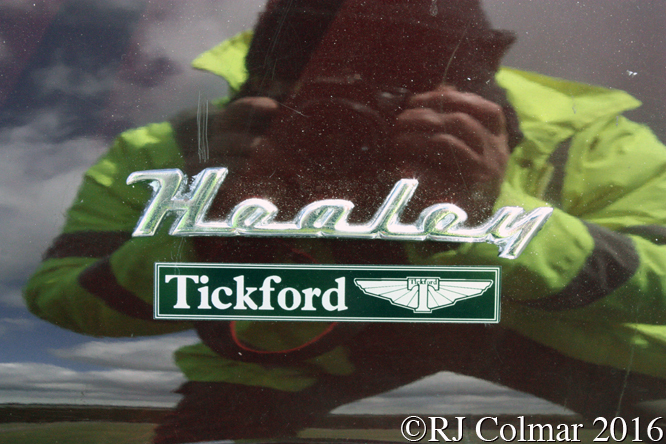 The design for the 5 seat 2 door bodywork for the Healey Tickford is credited to Winston Chater, it was heavier than the Elliot body in part due to the replacement of the perspex window’s of the earlier model with glass items, and the introduction of a proper boot / trunk. Healey Tickfords were built on three different versions of the Healey Chassis starting with the C Type in 1950, the BT Type in 1951 and the last on the F Type chassis in 1954. The introduction of the BT chassis saw the additional triangular vents either side of the main radiator intake. The Healey Tickford built from 1950 to 1954 would prove to be the most popular of the Riley powered Healey’s with 222 examples built. 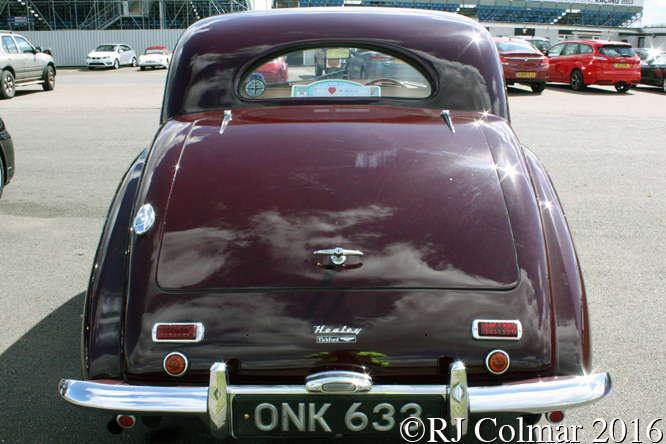 Today’s featured Healey Tickford, seen during last weeks VSCC Spring Start meeting at Silverstone, was built on a BT chassis in 1952 and first registered in the UK on October 15th the same year. Thanks for joining me on this “Glass Side Windows” edition of “Gettin’ a li’l psycho on tyres” I hope you will join me again tomorrow. Don’t forget to come back now ! 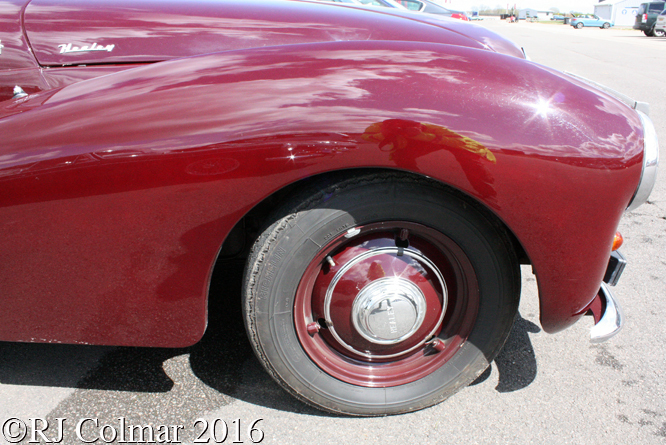 This entry was posted in Uncategorized and tagged Bt, Chater, Colmar, Elliot, Healey, Psychoontyres, Ralph, Salmons, Silverstone, Spring, Start, Tickford, VSCC on May 1, 2016 by Ralph. In 1887 French Engineers René Panhard and Émile Levassor founded Panhard et Levassor to manufacture motor cars and using a Daimler motor manufactured under license offered their first car in 1890. 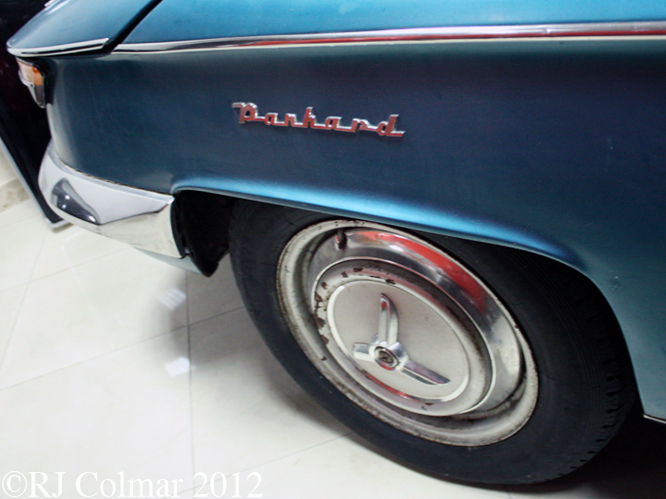 All of their early cars were one off designs as they introduced a string of improvements on successive models. In 1891 they built a vehicle with a front mounted motor and rear wheel drive that would become ubiquitous in the motor industry for over half a century. 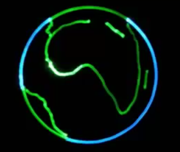 After a 48 hour 48 min drive Émile Levassor crossed the finish line first in the first mass start motor race, the 1,178 km / 731 mile which in 1895 Paris Bordeaux Paris. 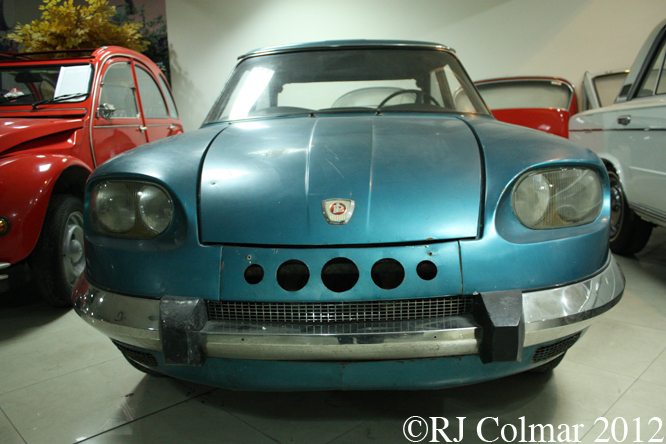 Panhard et Levassor was not awarded the win because the race was intended for vehicles with 4 seats and Levassor’s car only had two as did the Panhard et Levassor which came second. Recording many race victories Panhard et Levassor became one of the largest automotive manufacturers prior to the Great War of 1914/18. Between the two World Wars Panhard et Levassor diversified into new areas including, like Bugatti, into rail buses. 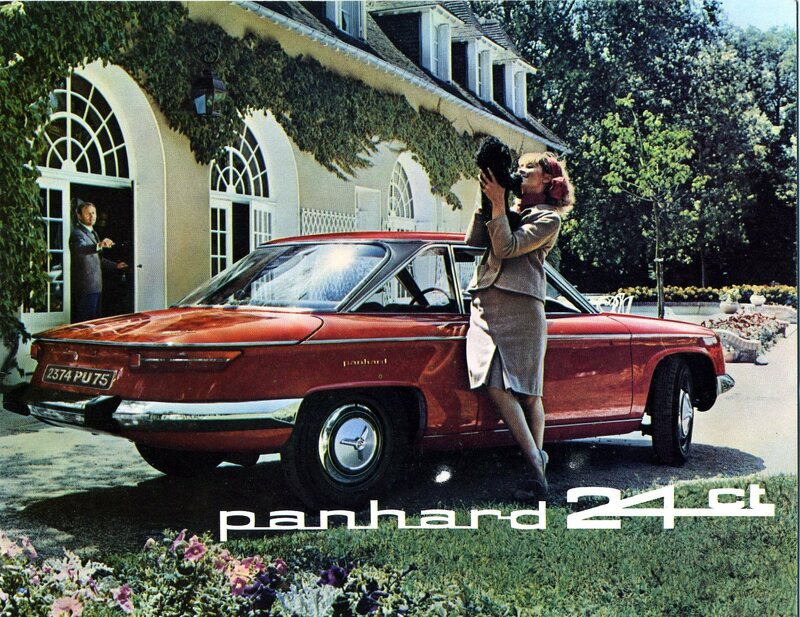 After the 2nd World War Panhard focused on making light cars with two horizontally opposed cylinder motors and front wheel drive. Unofficial support for racing car manufacturers like Deutsch et Bonnet led to many success at Le Mans in the Index of Efficiency classifications during the 1950’s and 1960’s. 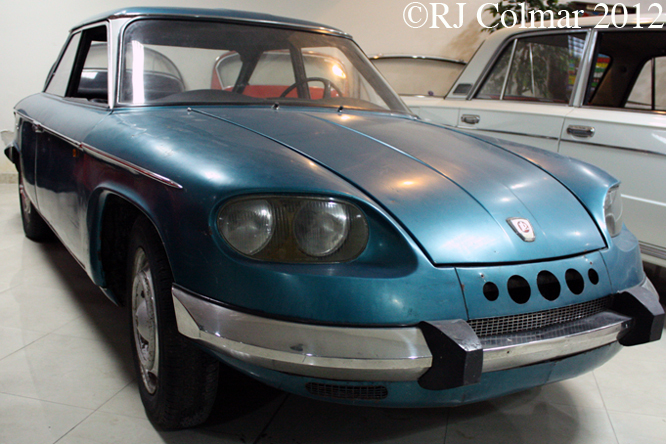 The Panhard 24 bt like the one seen here at the Malta Classic Car Collection was launched in 1964 featuring and air cooled 848 cc / 51.7 cui two cylinder engine, with origins dating back to the late 1940’s, driving the front wheels which allowed for the exceptionally low bonnet line which results in exceptional aerodynamic efficiency. 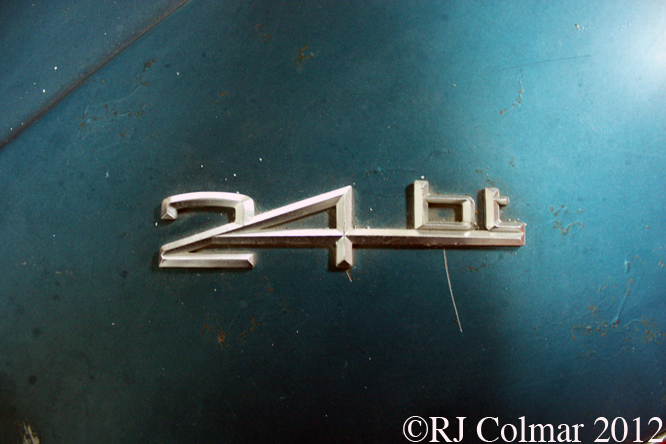 In 1965 Panhard was absorbed by Citroen during a period of rationalisation that was rampant throughout the European motor industry, so as not to compete with Citroen’s de luxe four door, four seater AMI 6 Citroén kept the spec of the 24 bt high and vetoed the development of a four door version. 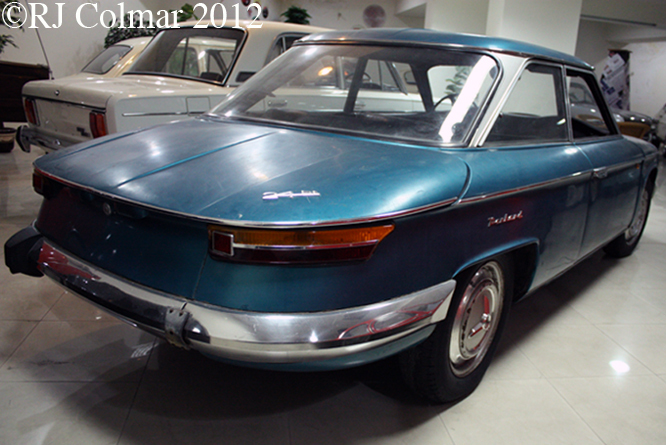 Like, among many others, numerous BMW’s, the NSU Prinz, Stingray Corvette and Corvair from Chevrolet the Panhard 24 bt had a distinctive chromed trimmed midrift. Saloon / Sedan 24 bt’s and the Coupé 24 ct‘s were amongst the earliest vehicles to feature integrated front and rear bumpers which gives the cars an efficient and stylish appearance which is taken for granted on new models these days but was well ahead of the curve even when production of the 24 bt ceased in 1967 marking the end of Panhard as a passenger vehicle manufacturer. Thanks for joining me on this “Au Revoir P et L” edition of ‘Gettin’ a li’l psycho on tyres’ I hope you will join me again tomorrow when I’ll be looking the 1955 Indianapolis Pace Car on Americana Thursday. Don’t forget to come back now ! This entry was posted in Uncategorized and tagged 24, Bt, Car, Citroen, Classic, Collection, Colmar, Émile, GALPOT, Levassor, Malta, Panhard, Ralph, Rene on May 16, 2012 by Ralph. Just 88 Bristol 407’s were built between 1961 and 1963. The 407 was the first Bristol model launched after ownership of the Bristol Car Company had been taken over by the Bristol Aeroplane Company founders grandson Sir George White 3rd Bt in partnership with Bristol’s preeminent retailer Tony Crook in September 1960. 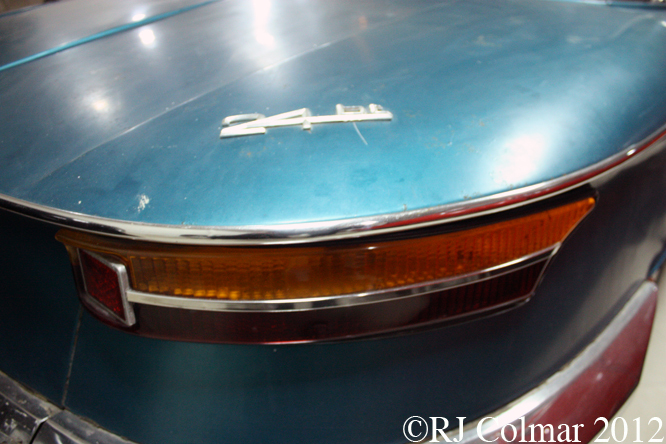 The exterior of the Bristol 407 is distinguished from its predecessor the 406, which I have yet to write a blog about, by a horizontal bar across the radiator grill at the front and twin exhaust pipes at the rear. Underneath the car could not be more different, the 407 is powered by a Canadian built 5130 cc / 313 cui Chrysler V8 connected to a push button operated Torqueflight transmission, a combination which first came to the attention of of Sir Reginald Verdon Smith the Bristol Aeroplane Company director in the 1950’s on a private visit to Canada. Bristol attempted to develop it’s own aluminium block V8 in the 1950’s but, insufficient experience casting aluminium and lack of capital thanks to the spiralling cost of aircraft development elsewhere in the Bristol group of companies meant that the V8 never got beyond an underdeveloped prototype stage at which crankshaft main bearing housing distortion presented an obstacle to production. Changing to the Canadian V8 from the hitherto BMW inspired straight 6 necessitated replacing the former transverse leaf front suspension with a pair of coil springs and replacing the highly praised rack and pinion steering with Marles worm driven steering. 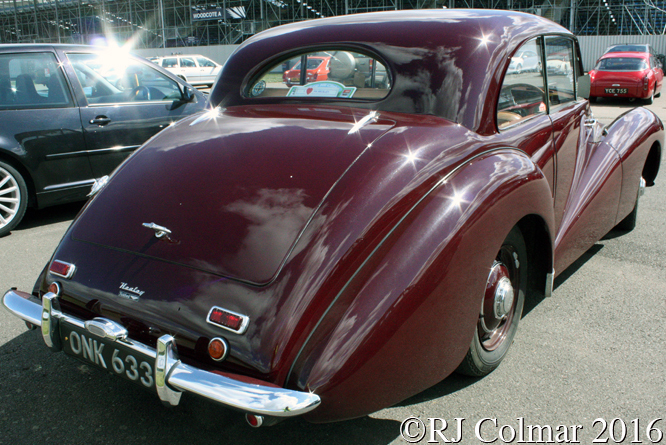 The chassis was fitted with Dunlop disc brakes all round and the aluminium body production was moved from Jones Brothers to Park Royal Vehicles in London. The 407 chassis set out the basic architectural features for all Bristol’s with many incremental modifications right through to the introduction of the Bristol Fighter in 2004. 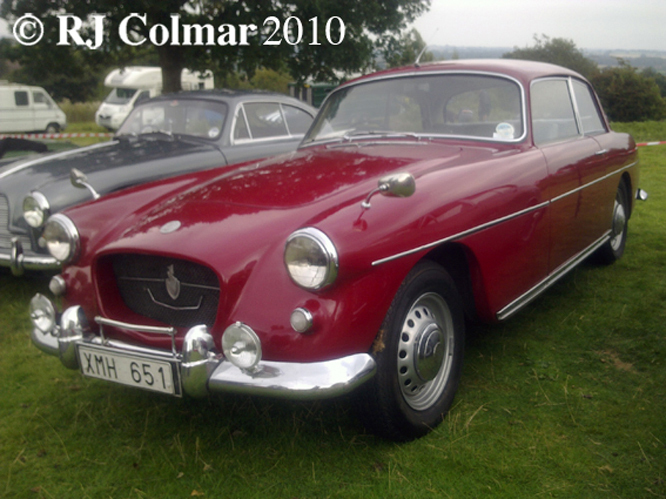 This particular model photographed at a Loton Park VSCC meeting is registered in Sweden, notice that it is a Right Hand Drive model, Sweden switched to Left Hand Drive in September 1967 to bring it into line with it’s Scandinavian neighbours. 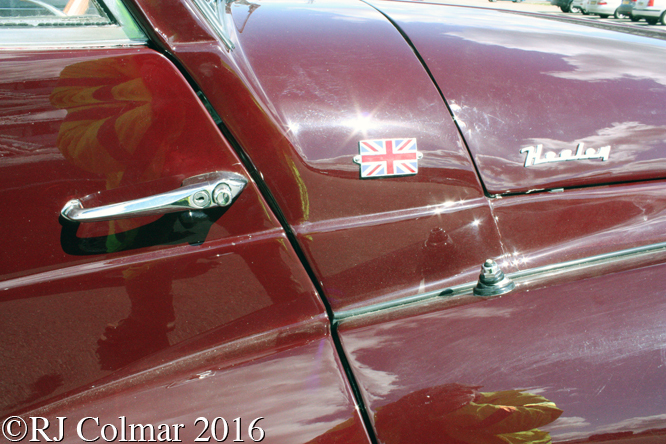 My thanks to Christopher Balfour who’s book ‘Bristol Cars a very British story‘ provided many of the insights in today’s blog. 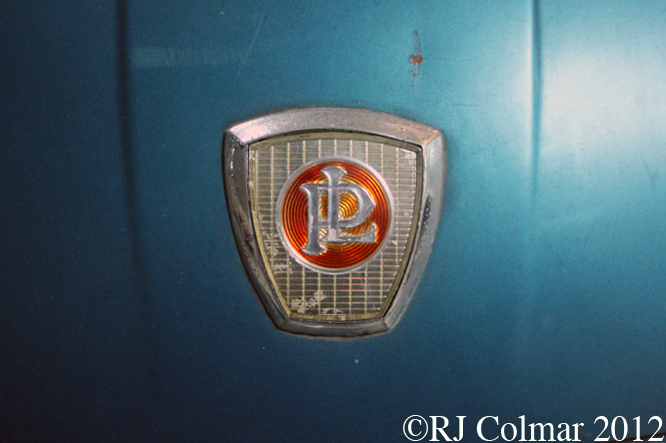 Hope you have enjoyed today’s Marles worm driven steering edition of ‘Getting a lil’ psycho on tyres and that you’ll join me again tomorrow for a look at the even rarer Bristol 410. Don’t forget to come back now ! This entry was posted in Uncategorized and tagged 407, Art, Balfour, Bristol, Bt, Christopher, Chrysler, Crook, George, Marles, Park, Psycho, Royal, Sir, Tidesco, Tony, Torqueflight, Tyres, Vehicles, White on February 23, 2011 by psychoontyres.